Join us for a free co-ed group ride every Thursday night throughout the summer led by WPT Racing Powered by jans.com mountain bike team members and guides from White Pine Touring. 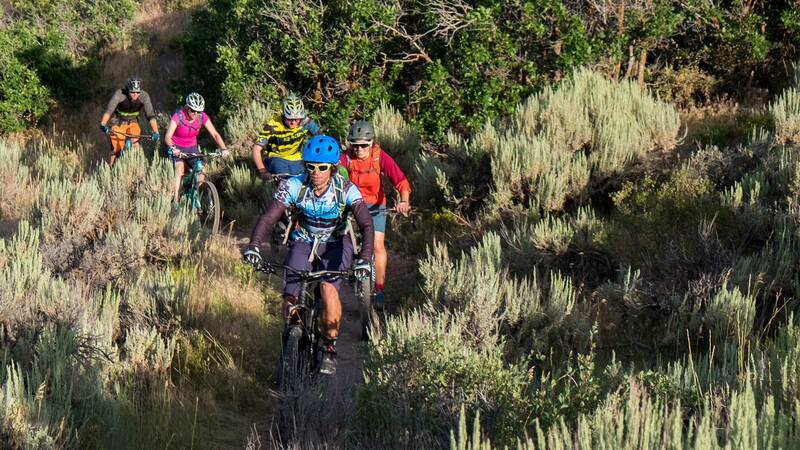 Join a group matching your ability level and enjoy a fun, two-hour guided ride on Park City’s epic singletrack. The last Thursday of every month includes a free BBQ with food and adult beverages provided by local vendors. Don’t miss out on this awesome ride! This group is designed for less experienced riders who are still gaining confidence on singletrack and prefer less technical terrain. This ride will involve the least climbing, and least amount of vertical. If you’re new to mountain biking, and unsure of your ability, this is a great place to start. These rides average 8-10-miles and 400 vert in approx. 2 hours. This group is designed for riders who are comfortable on a variety of singletrack, including moderately technical sections, higher speeds, and sustained climbs. 'This ride will balance climbing and descending, with varied terrain along the way. This is our only ­self-guided group, and it is designed for expert/pro riders who are looking for the ultimate workout and challenge. This ride involves prolonged climbs at a fast pace, and is ideal for riders seeking the most intense ride option available. This group is designed for riders who tolerate climbing to maximize fun on the downhill. This ride emphasizes leisure and camaraderie on the climb. If you like downhills that challenge your skills with a mix of tech, flow, and speed, this is your group.